If your child bites her nails, she’s not the only one. Around 50 percent of children between 10 and 18 bite their nails at least occasionally, and for many kids, the habit starts even younger. It’s one of the most common “nervous habits,” a category that also includes hair-twisting, nose-picking, and thumb-sucking. Formally, it's characterized as a body-focused repetitive behavior. So while some kids bite their nails because they are fidgety, others don't know what else to do when they feel anxious. Fingernail biting can be self-soothing. In addition to being gross to witness, nail-biting could do some damage to your child’s teeth. So if your child is particularly aggressive when he's gnawing on his nails, it may be important to address the issue with his dentist. But for the most part, nail-biting doesn’t create any serious health issues—and it usually isn't a sign of a deeper rooted issue. Instead, it's just a little nervous habit that often drives parents nuts. Since most kids eventually outgrow nail-biting, some parents find the best approach is to simply ignore it. But, for other parents, looking the other way is just too hard to do. 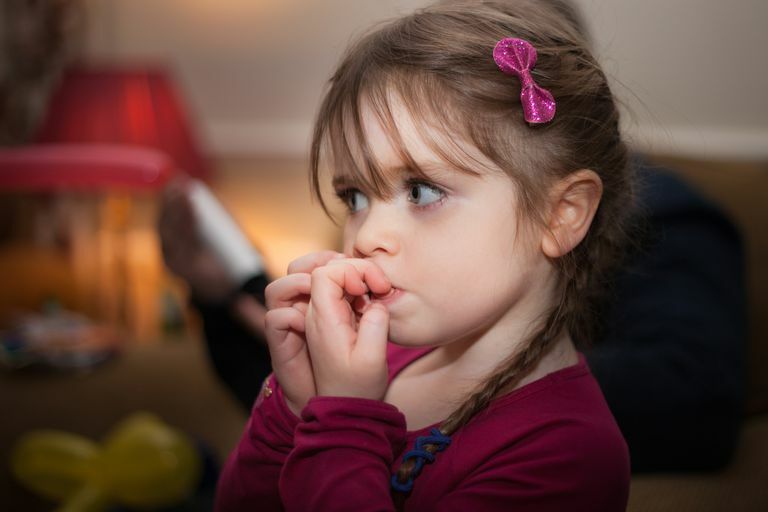 If nail biting has started out of the blue, you might spend a few minutes thinking about whether your child might be undergoing a bit of anxiety or stress. Keep in mind that some positive events, such as being promoted to a new reading group or getting a new pet, can be stressful for kids. Cut his nails daily. Cutting your child’s nails lessens the surface area under the nails—which means less dirt and grime. Then, if he does bite his nails, there will be fewer bacteria that gets into his mouth. Take good care of the cuticles, too; bacteria that get into the skin surrounding the nail can cause a nasty infection. Keep a small nail file or clippers in your purse or on his own personal key chain. Sometimes, a snagged nail is simply too much to resist. Find a substitute. Look for something healthy your child may be able to put into his mouth. For an older child, it might be regular snacking on crunchy celery and carrot sticks. Just make sure you don’t substitute nail-biting for sugary snacks or you'll be trading one bad habit for another. Give your child something else to focus on. Find something that will keep your child’s finger’s active. He might like to gently stroke a smooth “worry stone” that he can keep in his pocket, squeeze a small stress ball or fidget with Silly Putty. This allows him to focus on the texture and feel of what’s in his hands, rather than focusing on the sound and feel of biting his nails. Pick a subtle signal between the two of you that will nudge her to stop biting. When you see her nibbling, lightly touch her on the arm or use a code word that will alert her without announcing it to everyone else. This will help her to become more aware of when she’s doing it—after all, so many of these nervous habits are done subconsciously. Create a reward system. Establish a sticker chart and mark off every day that your child doesn’t bite his nails. If your child can't make it a whole day, you may need to break the day down into smaller chunks of time, like “before breakfast” or “during dinner.” Once he collects a specific amount of stickers give him a reward—like a trip to the park for five stickers. Book a manicure. While your son might not be super-into the idea, your daughter might be excited to get her nails done once they’ve grown out a bit. Not only can it become parent-child bonding time, but the compliments she will get on her gorgeous nails might discourage her bad habit. Try bite-averting nail polish. There’s always the standard fallback: a bite-averting nail polish that tastes terrible or burns a little when she bites. (Be careful, though, as some have acetone or cayenne pepper in them, and can hurt quite a bit if your kid rubs her eyes.) Talk to your child’s physician or a pharmacist to learn about the safest options for kids. The bad taste will at least make your child more conscious of the fact that she's putting her fingers in her mouth. Allow for natural consequences. Keep in mind that natural consequences can be good teachers. So if your child occasionally causes his fingers to become sore from biting his nails too short, the pain may motivate him to stop biting his nails in the future. Calling too much attention to your child’s bad habits is likely to backfire and his nail-biting may get even worse. Punishing your child or embarrassing him for biting his nails also won’t be effective in helping him change his habits. Help your child manage his nail-biting but don’t get too wrapped up in making him stop. Yelling or telling him he’s “gross” won’t help. Skip the lengthy lectures about all the reasons why putting his fingers in his mouth is disgusting—that isn't likely to work either. Helping your child put an end to biting his nails will be much more effective if he's on board with the plan. If he's not particularly motivated to quit, your efforts aren't likely to be successful. So be patient with him and if he's not interested in stopping, you may need to wait until he is. You might broach the subject from time to time by saying something like, "I notice you bite your nails a lot. Do kids at school ever seem to notice?" Mentioning that other people might see him doing this might make him a bit more aware of others perceive him. Similarly, you might ask him, "It looks like your fingers get sore sometimes when you bite your nails so much. Do you ever wish you didn't do that?" If your child is invested in giving up the habit, work together on coming up with a plan to help him. He might identify his own "code word" you can use or he might say he wants a specific reward if he can grow his nails long enough that you can have to cut them (as opposed to chewing them off before they can grow). Nail biting may get better at times and then get worse again. That’s often part of the process of getting rid of a bad habit. However, over time, your child’s nail biting is likely to subside. Bad habits are hard to break. Just think about all the bad habits that you, as an adult, have struggled to give up over the years. If your child gets down on himself for biting his nails, remind him that you guys are in this together. And before you get too frustrated, remind yourself, too—this is probably only a phase. Common Childhood Habits. HealthyChildren.org. Published November 21, 2105. How Can I Get My Child to Stop Biting Her Nails? University of Utah Health. Published February 7, 2016. Nail Biting. Michigan Medicine. Published October 13, 2016.